Pianist John Hess grew up in Canada, studying music at the University of Toronto, where he received the W. O. Forsythe award for Outstanding Graduating Pianist. Further studies took him to the University of Michigan, as a full fellow, where he received a Doctorate of Musical Arts in Collaborative Piano with Martin Katz. 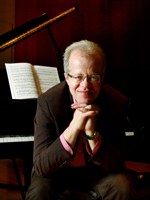 Since 1997, John has been Head of Collaborative Piano Studies at The Western University, Canada, where he was most recently awarded the 2014 Faculty Scholar Award. Over the past thirty years, John has pursued two concurrent music strands – art song and contemporary music. Always in demand as a recital partner, notable singers he has partnered include Joseph Calleja, Jane Archibald, Erin Wall, Krisztina Szabo, Valdine Anderson, Maureen Forrester, and Ben Heppner, with whom he has toured extensively in Canada over the past fifteen years. At Canada’s Banff Centre for the Arts, John was a permanent vocal coach for the esteemed Academy of Singing. In contemporary music, John has played with virtually every new music organization in Toronto, including Esprit Orchestra, Soundstreams, New Music Concerts, Array Music, and Continuum. In new opera, he has played, coached and directed new work at the Canadian Opera Company, Calgary Opera, Pacific Opera Victoria, Tapestry, and Opera in Concert. At the Banff Centre for the Arts, John was Associate Artistic Director of the 20th Century Opera and Song program, which commissioned, developed and produced new works, and where he developed an integrated program for contemporary vocal technique. At the Western University, John founded the Contemporary Music Ensemble, and developed a third stage for new and baroque opera. In both art song and contemporary music, John has been extensively recorded by CBC Canada. In 1995, together with his Irish partner Dáirine Ní Mheadhra, John founded the chamber opera company Queen of Puddings Music Theatre in Toronto. Under their inspired direction, the company emerged as a bold and provocative leader of new Canadian chamber opera. Over the span of twenty years the company radically changed the dynamic of new Canadian opera, by commissioning new works and producing ground-breaking productions that were original and striking, with an uncompromising artistic standard that drew intense critical acclaim. Notable opera productions were Beatrice Chancy (Rolfe, Elliott-Clarke), an adaptation of the Italian Cenci tragedy and set in Nova Scotia, bringing to life the story of African-Acadian black slavery in Canada. The production toured Canada, and was filmed and broadcast nationwide by CBC TV. The Midnight Court Opera (Cúirt an Mhéan Óiche) (Sokolovic, Bentley), an adaptation of Brian Merriman’s famous and raucous Irish epic poem, was chosen by Toronto press critics as one of the Top Ten Toronto shows in all genres in 2005. In 2006, the production premiered at England’s Royal Opera House, Covent Garden. Beauty Dissolves in a Brief Hour (Klanac, Rea, Shi), a Mandarin, English and Medieval French language triptych, toured Canada. Love Songs (Sokolovic), a virtuosic tour de force opera for one female singer, based on love poems in multiple languages, toured Canada and Europe, including the Holland Festival and the Zagreb Biennale, where it was declared best production of the festival. Inês (Rolfe, Bentley), an opera inspired by Portuguese Fado, was an adaptation of the legend of Inês de Castro and situated in Toronto’s Portuguese community in the 1960’s, featuring opera singers in combination with a Coimbra fado singer. Svadba-Wedding (Sokolovic, original Serbian poetry), an a cappella opera for six female singers, sung in Serbian, epitomized the company’s aesthetic of a physical singing theatre. Svadba-Wedding won the 2012 Dora Mavor Moore Award for Outstanding New Opera, and toured Canada, Philadelphia, and Europe. Beckett: Feck It! (Beckett, Hamilton, Barry, Sean-Nós), a show combining music, theatre, and Irish madness juxtaposes Samuel Beckett’s shorter plays with contemporary classical music from outstanding Irish composers inspired by his appreciation for the absurd. In October 2013, John was presented with the Opera Canada Ruby Award in recognition of a distinguished career as musician, producer, conductor and educator in the Canadian operatic community, and particularly for his work with Queen of Puddings Music Theatre. In the current season, along with his university work, John is touring with Queen of Puddings’ productions in Europe, and performing chamber music concerts throughout Canada. Additionally, he is the Co-Director of Amhráin ar an Nua-Nós, a new long-term Canada-Ireland project to commission, create, and produce a body of original contemporary art song and chamber opera, written solely in the Irish language.